Eva Longoria files for divorce, since her husband cheated with his ex teammate Brent Barry's wife Erin. They married on July 7, 2007. 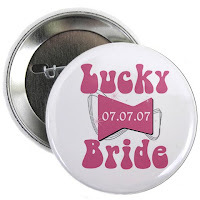 Does that mean that these bride buttons will soon be collectibles?